Moon means mind: Moon is associated with the functionality of mind. It is believed that the moon controls the power of mind and versatility. It is also believed to provide power of meditation, concentration and resistance against cold diseases. The Moon in Vedic astrology is called CHANDRA. 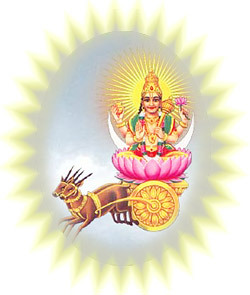 In Sanskrit CHANDRA means "bright and shining". The Moon is also called SOMA, named after the intoxicating sacred drink used in Vedic sacrifice. Where all westerners know their Sun-sign, you will find all Hindus know their Moon sign, for the Moon, and its birth sign are important in Hindu culture and astrology. Moon importance in vedic astrology: In fact before british rule, Hindus do not celebrate their birthday on the calendar day on which they were born. Instead, they celebrate their birthday in the month they were born when the Moon enters the part of the sign it was in at birth. Such is the importance of the Moon in Vedic culture. The bright Moon is considered a benefic of the highest order, and the dark Moon is considered a malefic. The Moon is known as a hare, or rabbit in Vedic lore, as he jumps faster than any of the other grahas. The Moon rules over the sidereal sign of Cancer (Karka). He is exalted in Taurus (Vrish), and fallen in the opposite sign of Scorpio (Vrischik). Moon characteristics: The Moon is a karaka of many things. He is an indicator of the mother, and females in general, the public, general well-being and happiness, femininity and beauty, the eyesight, memory and the mind. Many western students of astrology are shocked to discover that the Moon is indicative of the mind, and not Mercury. The Sun is the indicator of the soul, and the Moon is the vehicle of the mind that receives the light of the soul. Mercury is the further process that is called the intellect, which places a value on what the mind has received. The Moon as the mind is indicative of all the senses and their ability to perceive life in its entire splendor. Mercury represents a further distillation and conceptualization of that process and its ultimate intellectualization in forming judgment. The Moon is most comfortable and powerful in the 4th House; she also likes the angles. The Moon is particularly beneficial for the water sign ascendants of Cancer, Scorpio and Pisces. Her nature is KAPHA, or watery. Her gem is the Moonstone and Natural Pearls. Her metal is silver and her direction is Northwest. Moon rules the mood or mind of invidual. In vedic astrology moon situated house in horoscope is called Rashi of individual. A Person has special interset to the characteristics of that horoscope house. Rashi plays major role in person friendships. Same type of Rashi people have good understanding. CHANDRA (MOON) is a lovable God-a loving god. Pleasing to children as well as elders universally appealing to everyone whatever may be the religion of the onlooker. Sages and devotees invoke the Goddess Mother in Chandra and meditate for hours. This graha (Moon) causes nightfall strengthens the mind, purifies the blood and is considered as the mother who radiates nectar (Amrut). Worship of this graha is said to be beneficial for relief from all sorrows, helps in curing mental afflictions etc. His cool rays radiate happiness around. He adores the head of Lord Siva. Moon Nakshatras: In Rohini, Hast, Shravan, Punarvasu, Vishakha, and Purva Bhadrapad nakshatras it gives good and beneficial effect. It also gives favorable effects if it is in Kritika, Uttra Phalguni, Ashlekha, Jyestha, Uttra Khad, and Revati nakshatras. Moon organs: Rules the left nostril, eyesight, the breasts, and the brain (memory). Moon Diseases: An afflicted, debilitated, exiled, or weak Moon causes cold, cough, fever, eye, ailments, lunacy, paralysis, epilepsy, hysteria, colic pains, beriberi, intestinal disorders, throat troubles, bronchitis, dysentery, neurosis, typhoid, and cancer. Moon friends and enemies: Sun, Mars, and Jupiter and the Moon's natural friends, and Mercury, Venus, and Saturn are its natural enemies.